Metal Finishers, Inc., a business affiliated with Siskiyou Corporation of Grants Pass, Oregon was founded in 1988 as a means to guarantee a reliable quality source of anodizing for Siskiyou Corporation product line. "We are pleased to offer an anodizing service that is operated on perfection and our customers will receive nothing less." Robert S. Hodge, President, Metal Finishers, Inc. William S. Hodge, Vice President, Metal Finishers, Inc.
Siskiyou Corporation, with over 47 years of instruments building experience for the most demanding markets, developed and re-engineered the anodizing process to provide the very best service and product. Skilled People with over 20 years experience in the anodizing business will insure that process control is the backbone to this business. Experienced people, with a longer tenure, assist in maintaining the highest quality standards. 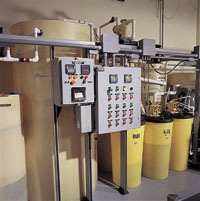 Process Control,using smaller lots than the usual anodizing operation, thus permitting optimum control of all variables. Minimized racking marks mean better cosmetics. All temperature is controlled to +/- 2 degrees Fahrenheit. These steps taken in carefully processing each order, coupled with the "state of the art" in waste treatment contribute to processing line quality, unequaled in the industry. Sulfuric acid anodizing (Type II) a most cost effective anodizing process, providing excellent abrasion and corrosion resistance. Laser Engraving "in-house" can be supplied with customer logo, custom artwork or precision graduation in either linear or rotary format. Transporting your parts to Grants Pass may be a very small cost when compared to the value guaranteed in a "perfect anodizing process". Let Metal Finishers show you how, for many years prior to our own facility, we packaged and shipped appearance critical parts to our source. Expect Perfection. 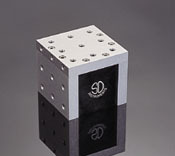 Your customers expect a perfect part, you should expect nothing less from your anodizer. Experience. With more than 20 years experience anodizing higher strength 6000 series aluminum in clear or black finish with a consistently superior finish. 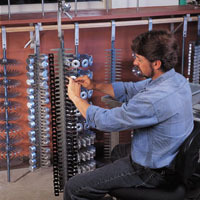 Quality Control begins with "best shop practices". 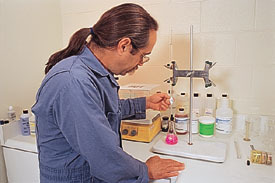 All chemistry control is attended to "in-house" with experienced personnel. Light fastness 8+ is guaranteed to architectural quality standards for minimum fade, providing a superior product for your customer. Prompt Service and Turnaround with attention to your order, for complete customer satisfaction. Additional Services: Vibratory deburring, graining of flat parts, and laser engraving your finished part.